The change in demand of Product A due to the change in the price of Product B is known as Cross price elasticity of demand. Let’s take an example to understand the calculation of Cross Price Elasticity of Demand formula in a better manner. We know Tea and Coffee are classified under ‘Beverage’ category and they can be called as perfect substitutes of each other. Thus certain price volatility of one commodity might affect the demand of the other commodity in the same way. Let us suppose an increase in the price of Tea by 5% might lead to an increase of the closed substitutes i.e. Coffee (we assume the price of Coffee remains the same) by 15%. Calculate cross-price elasticity of tea and coffee. Thus it can be concluded that each one unit change of price of Tea, the demand of Coffee will change by three units in the same direction. HEG Ltd. and Graphite Ltd. are competitors, both manufactures Electro graphite for Iron and Steel Industry. The raw materials required for manufacturing are Needle coke and Graphite which are extracted from mines. Graphite has its own Needle coke mine whereas HEG imports from outside and is dependent on import only. Due to the higher import duty, the cost price of HEG increased by 7.5% whereas the company has decided to increase the realization costs so as to pass on the increased costs by 5%. Due to this strategy, the demand for the end product of Graphite Ltd. was higher by 10% for a time being. Calculate cross-price elasticity of Graphite and HEG products. Thus it can be concluded that every one unit change of price of the product of Graphite ltd., the demand of product of HEG Ltd. will change by Two units in the same direction. Due to higher crude oil prices in the international market, there has been an increase in the price of petrol by INR 3/ liter (from the earlier price of INR 60 to INR 63). Thus, after the price has sustained for one month, statistically it has been found that the Sales of TVS scooters has been dropped by 10%. Find out the cross elasticity of Demand between Petrol and TVS Scooter. Thus it can be concluded that every one unit change of the price of petrol, the demand for the product of Scooters will change by Two units negatively. As they are related to each other, so the price elasticity is negatively correlated with each other. In the theory of Economics, Cross elasticity of demand can term as the degree of responsiveness of a particular product which could eventually result in a change in increase or decrease of other products depending upon the nature of it (be it closed substitutes or related products). The increase in the price of Fuel might lead to a decrease in lower demand for a two-wheeler. Thus these are negatively correlated with each other. For every rise and fall of the price of the product, the demand for other product will affect inversely. The same theory can be attributed to the ‘Closed substitutes’ products, the price sensitivity in most of the cases goes in the same direction of change in the price of the other product. The theory of Cross elasticity can be drawn on the Closed substitutes and Related products. So firstly we have to find out the nature and relation of the two products. One should be noted that the comparison can only be done with two products only. In the Modern business scenario, there has been competition between several products within the same industry or the same food items depending upon customer preference. So the price of the products is very sensitive in nature. Any change in price might hinder the demand for that product as the other competitor product is available at the same price. Management or industry analysts constantly evaluate the trends in the price of various products so as to meet the targeted revenue by the particular company, the market share of each product could be determined in a proper way and the change in the quantity of the products could be identified. The related commodity pricing is also important so as to get the essence of the public demand. The launch of a Scooter or a bike not only depends on the price and efficiency of the vehicle but it also depends on the pricing of a related commodity as well. Thus in case of two-wheelers, the prices of the Auto- ancillary also plays a vital role in determining the demand of the vehicles as the replacement costs might shoot up if the prices are not pocket-friendly. 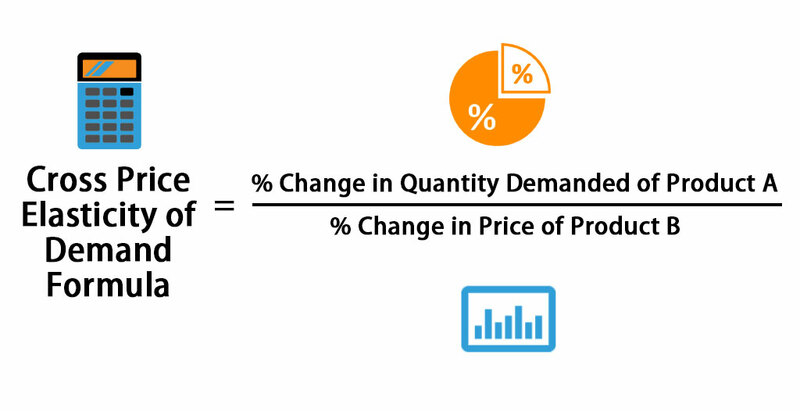 You can use the following Cross Price Elasticity of Demand Calculator.